I have to say I really love Etsy seller (and RIT Chemistry student) beadworkbyamanda‘s nerdy jewelry. 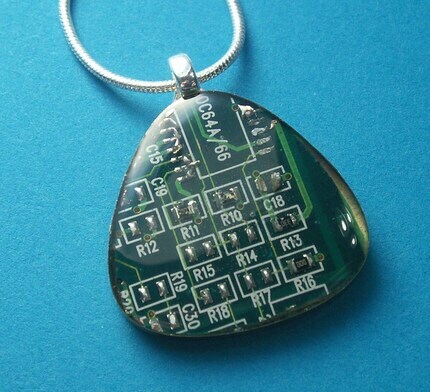 I’ve seen a lot of circuit board jewelry over the years, but this is the first that’s been nice enough I’d actually want to wear it outside of the hackerspace. She’s also got some rings which look equally awesome. Check it out! Rad idea with the resin coatings. I’ve toyed with wearable circuits / jewely made from circuit boards — but the shapes and the resin really make your work look fantastic. Given the different kinds of circuity and variety of colors they come in, this really allows for a ton of unique designs. What an interesting concept and one many techies like myself would probably sport. jyxpearl is China’s major pearl and semiprecious gemstone jewelry supplier. Wholesale pearl jewelry, semiprecious gemstone jewelry such as agate, lapis, tiger eye, obsidian, fluorite, tourmaline, crystals, coral, and turquoise jewelries. jyxpealr is China jewelry manufacturer of self-designed pearl and gemstone necklaces, bracelets, earrings, pendants, and other jewelriey. bridesmaid sashes– A. B. Ellie hand sews dress sashes for weddings, baptisms, prom and any special occasion, using only the finest materials. We make our customers look simply elegant. Funny piece of necklace. I love it! Wasn't beadworkbyamanda making also someNative American jewelry? I should buy one of these nerdy pieces of jewelry for my nerdy brother for his birthday . Interesting stuff. Too bad she passed, great to hear those old stories! I saw something similar to this a while back.. I think it’s neat to make necklaces out of things that you love. I’m going to start making some Antique Jewelry that really defines what I am. Obviously, it won’t be authentic, but a vintage style of sorts. This one is very wonderful jewelry.I like some Diamond for love and also making some ring for my self.I realy diamond is very amazing styles and look. for jewellery use in America and Europe.